It's time to change your underwear. No, not just a clean pair, not just a new pair - a totally different kind of underwear. My Pakage is looking out for yours. We set out to create the best mens underwear for sport and leisure in the world, and we're pretty confident that we did just that. We've got a lot of guys that agree with us, and more all the time. "My junk is incredibly comfortable right now." Can you say the same? That's just one testimonial from one of our diehard converts. How do we do it? What's the difference? We're glad you asked. Your comfort level goes from "okay" to "OMG" in our boxer briefs, trunks, and briefs because of our patented Keyhole Comfort Technology. Flat-front underwear is fine for mannequins, but we designed our underwear for a man, and that's why we created a 3-dimensional internal pouch that contains and cradles you instead of just flattening you out and squashing you up against yourself. The pouch gives you the room you need, and provides support so that you don't feel like you're just hanging out there. 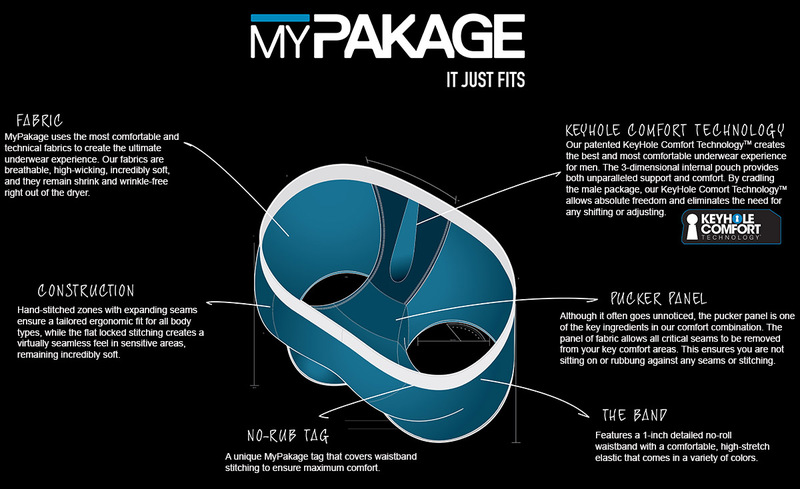 But what MyPakage's 3D pouch does that really makes all the difference is it keeps you in place - with no need to shift or adjust throughout the day-and-crucially -it keeps you out of contact with your legs so you don't have to worry about sticking or chafing. Like what you hear? Well, now's the time to make the switch to My Pakage. You need this kind of comfort in your life, and you need all the color and print options that our boxer briefs come in. That's right! This isn't one style fits all comfort. You can pick and choose from all of our options to get just the right look! Make My Pakage yours at HisRoom today! View the MyPakage fit agenda.